As a criminal defense lawyer in Philadelphia, I represent people who have been stopped by the police. Police officers are out there to watch citizens navigate the roads each day. Their presence means that an officer may be observing your driving habits when you get on the highway or travel on local roads. Police, however, are not able to see every car on the road, so how do you ensure that you are not pulled over? The odds diminish greatly when using common sense. In this article, I offer a few “common sense” suggestions to keep you from a traffic stop and, possibly, jail. In Pennsylvania, it is against the law to text and drive. Although our state’s texting law is difficult for the police to enforce, suspected texting and driving is enough to give law enforcement a reason to pull you over for further investigation. If you have an older vehicle that makes noise and smokes, the police are more likely to pull you over. Have your car repaired when needed and routinely change the oil and schedule maintenance checks to ensure optimal performance. One of the biggest offenses that will warrant a traffic stop is equipment malfunction. A headlight or taillight that is no longer operable will be reason enough to pull you over. All drivers and front seat passengers in vehicles, light trucks, and motor homes must wear seat belts. If you are transporting passengers age eight (8) or older but less than age 18, they must wear seat belts, no matter where they are riding in the vehicle. If you are a driver under the age of 18, the number of passengers may not exceed the number of seatbelts in the vehicle. You cannot be pulled over solely for not wearing a seatbelt. Under Pennsylvania law, seatbelts are a secondary offense, which means you will have to be initially pulled over for another infraction, such as speeding or dangerous driving. Tinted windows make police officers nervous during traffic stops, especially at night. The tinted windows prevent the officer from seeing inside the car and determining if there is someone or something that is going to hurt him or her. If you are stopped, lower all the car’s windows and place both hands on the steering wheel. You want the officer to know that you have nothing to hide and it will make the officer feel a little more at easy. Darkly tinted windows will almost always receive attention from police officers. It is rather easy to be detained by police but the odds are reduced with a common sense approach to driving. 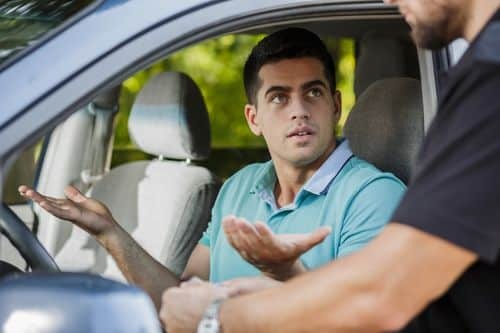 If you are ticketed in a traffic stop and feel that the stop and ticket were not warranted, let the Fishman Firm help you resolve the issue. I have the experience needed to dispute the charges and work toward a successful resolution.